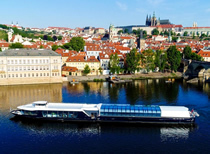 A delightful river cruise through the heart of Prague aboard a luxurious, ultra-modern boat with a retractable glass roof and sides. Enjoy panoramic views of the riverside attractions, a gourmet buffet dinner, and a live band to entertain, playing a selection of lively jazz music and popular tunes. The Prague Panoramic Dinner Cruise starts with a welcome glass as we set sail, passing under Charles Bridge. With the Old Town on one side of the river and the Lesser Town on the other, take in the stunning views of the city, including Prague Castle, the Rudolfinum, Prague Parliament and the National Theatre. The boat is heated in the winter and air-conditioned in summer. And as much of the vessel is made of glass, guests experience spectacular views all year round from inside the boat. On the warmest nights the glass roof is retracted. The price of this river cruise includes a 3 course gourmet buffet dinner, featuring a wide range of hot and cold food. The band plays several sets throughout the cruise, so after the meal sit back as they strike up another tune, and take in the beautiful ambience of the city over a complimentary glass of Prosecco. For further drinks, the bar on board serves a range of beers, wines, sparkling wines, spirits, and hot and cold soft drinks. The Prague Panoramic Dinner Cruise is the best buffet dinner cruise in Prague. It makes a nice restaurant experience for a romantic meal, a smart venue for a business dinner, or simply a fun night out for a group of friends or a family. 1. For large groups: we can offer a private boat, departure time of your choice, and tailor the cruise to meet the requirements of tourist and corporate groups for a supplement. 2. For groups of any size: we can offer a drinks package of 3 drinks per person. Order now, then on the day choose from beer, wine and soft drinks: 220 CZK per person. River cruise + Welcome drink + Glass of Prosecco + Gourmet buffet dinner + Live band.